Many view Landseer’s The Monarch of the Glen as an iconic painting of, and from, Scotland. 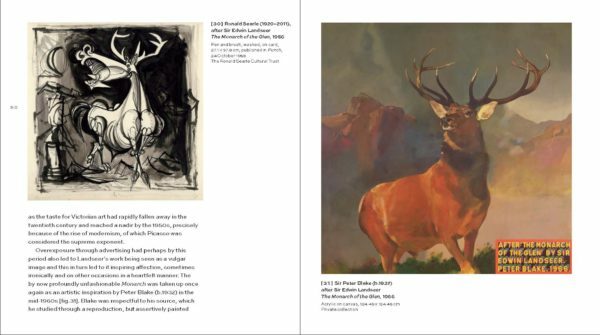 But the story of the painting is not without controversy, as Christopher Baker reveals in this illuminating introduction, which sketches the historical and contemporary context of this much-loved artwork. [Landseer’s] greatest enjoyment was to wander in the lonely glens, or climb to the steep mountain-top, in search of that nature, animate and inanimate, with which his heart was in accord, and there it was that he derived the inspiration which prompted the greater part of his noblest productions. Sir Edwin Landseer, The Monarch of the Glen, c.1849–51. Oil on canvas, 163.8 x 168.9 cm. Scottish National Gallery Edinburgh. Few British paintings of the nineteenth century are as instantly recognisable as The Monarch of the Glen. It has so often been reproduced that it has become part of our shared visual memory. This familiarity means that it’s hard to look at it afresh; that is, however, precisely what this book sets out to try and do, by placing the painting in the context of the career of the highly-accomplished artist who created it and considering some of the many different and contradictory interpretations it later inspired. These have ranged from it being seen as a splendid technical achievement and a romantic evocation of Scotland’s wildlife, to it being viewed as an archaic image and an irrelevant aristocratic trophy. Through endless reproduction it has also almost become a kitsch icon, in a way that would have been inconceivable to Landseer and his contemporaries. 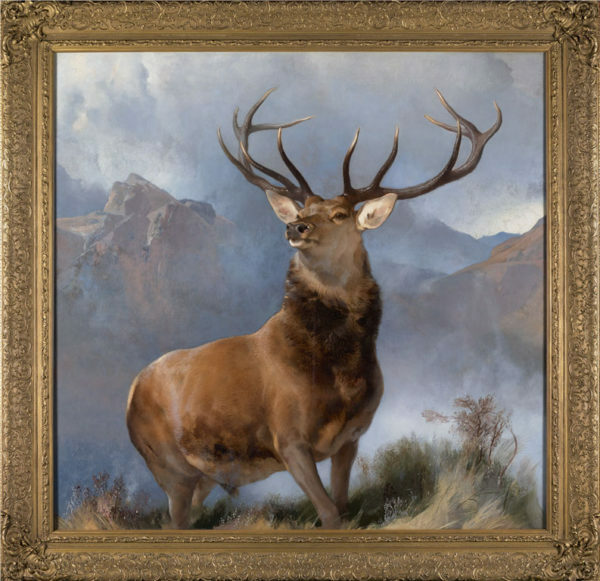 In March 2017, 166 years after it was painted, Landseer’s Monarch of the Glen finally became a public possession, when it was acquired by the National Galleries of Scotland. 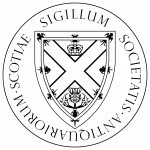 It seems especially appropriate that it now has this status, as for much of its life the picture has played a role in British and Scottish popular culture, being so often reproduced and ‘owned’ at least by proxy by so many people, whether through engravings or in connection with whisky bottles. The painting now poses a key question: is it still fitting to promote a work by an English artist who conformed with aristocratic taste, which is clearly cloaked in a romantic view of Scottish culture, as relevant in the twenty-first century? This is an especially compelling issue at a time when Scotland is defining a strong role for itself as a distinctive, modern, democratic and technological nation. Some will undoubtedly conclude that the painting is an anachronism. Others will want, however, to continue to celebrate the picture because of Landseer’s remarkable artistry and the way in which it symbolises the natural wonders of the country. What is certain is that his work has retained a powerful quality of recognition and been able to take on a wide range of different roles and interpretations, often simultaneously. 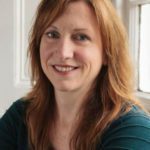 It will now be seen by more people than ever before and new debates and artistic responses will undoubtedly develop around it. 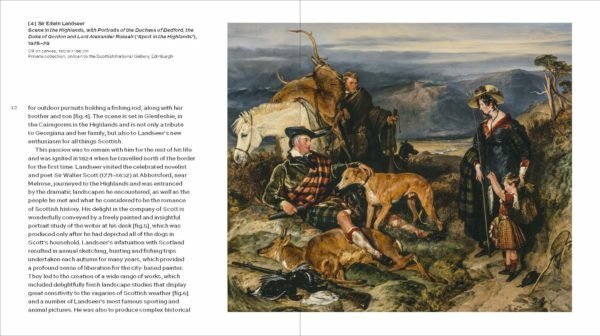 These may well focus on another fascinating issue: whether the painting fits into the narrative of Scottish art? 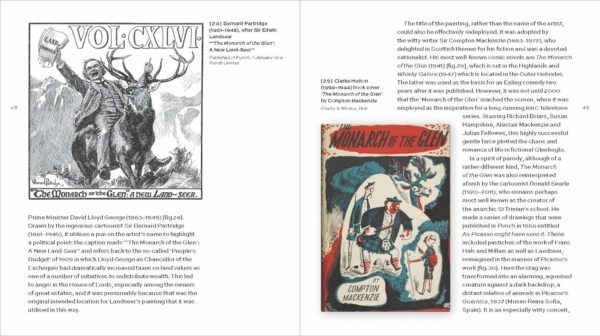 In answer to this, perhaps it is helpful to view The Monarch of the Glen as an important example of Scotland’s art – a more inclusive description which accommodates the work of painters from across Europe and beyond who have contributed to the rich imagery that has come to be associated with the nation. 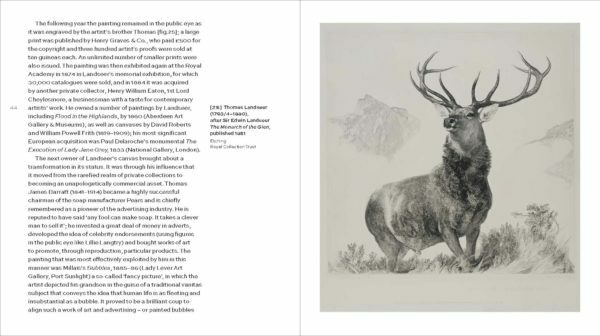 The Monarch Of The Glen by Christopher Baker is out now published by National Galleries of Scotland priced £9.99. The spreads featured above are all from this book.